Hello! This is me, Bee-C. I'm the mascot of the this Erasmus+ KA2 action project. Why is my name Bee-C and how I came to be? Well, the project is titled "From Europe 1010BC to Europe 2020PC" and my name comes from the sound play of the letter combinations BC and PC. Bees are, as everyone knows, very busy and hard-working animals, just as hard-working as anyone involved in the project. Besides, did you know that the bees communicate with each other through their so-called dance movements. 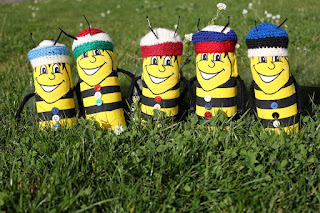 As one of the aims of the project is to find out about the history and different means of communication, then who or what else would fit to be the mascot as well as us, the bees. There is me - the Mother Bee and then there are my lovely children Estonian Bee-C, Finnish Bee-C, Polish Bee-C, Slovenian Bee-C and the Italian Bee-C. They lead the project work in their own countries and lead the swarms of smaller and bigger busy bees in each of the partner schools. All six of us were prepared by Inga from Võru Kreutzwald School. Five wonderful Bee-Cs and the Mother Bee. I will travel from country to country, carrying messages and telling everyone about our adventures in this blog. So, keep on reading and be a part in our adventure! Today is the very first official day of the "From Europe 1010BC to Europe 2020PC" project. The project will continue for three years and involve partners from Estonia, Poland, Italy, Slovenia and Finland. The target groups of our project are the elementary level students and the teachers, but we also try to make an impact on the lower-secondary level students, students' families, the whole shools' staff members and the local community. The focus is mostly on finding out about how comunication has happened and developed throughout the history of the world (especially the time period from 1010 BC to 2020AD) and developing our ICT skills (therefore also the reference to PCs = the era of personal computers) through integrated learning. We aim to turn modern devices like smart phones and tablets etc from toys, which they very often happen to be to our students at present, to valuable tools for learning that help to individualize the study process and, hopefully, also make it more enjoyable for all parties involved. We hope that this kind of modernization in the sudy methods will, in the long run, help us to reduce the numbers of students who don't like school or who struggle at school, or even worse, who eventually decide to drop out of school.